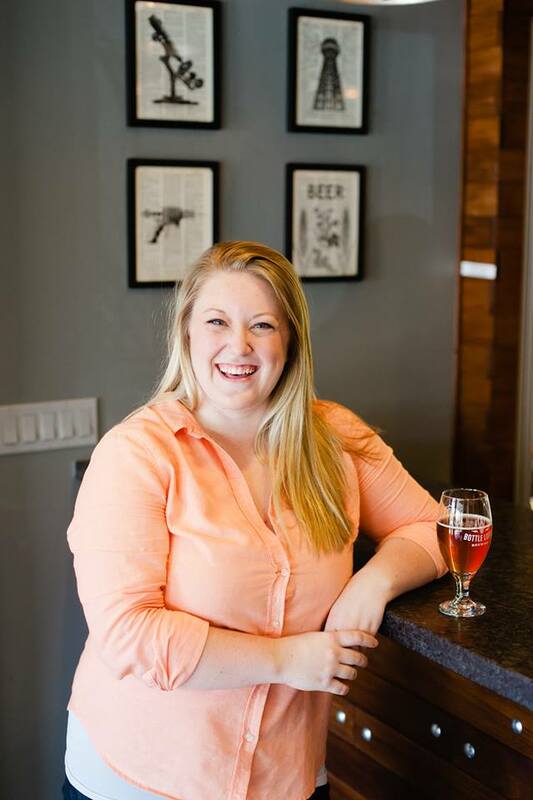 If you were one of the thousands of people who celebrated Bottle Logic’s week-long anniversary celebration in March, you’ve no doubt seen the infectious smile of Lindsay Langton. As I’ve seen her do everything from beer-list chalkboard art to sweeping the floors, I figured it would be a good time to sit down and have a chat with her over a beer. What is your official job title and what is your day-to-day like? I’ve been wielding the Lord Commander title officially for a couple years now! It started off as a joke, but I think it’s become a pretty concise way to encapsulate my role at the brewery. My day-to-day isn’t terrifically consistent, which is something I really enjoy. Last week I was writing our anniversary week field journal, then bounced to Tampa to represent the brewery at Hunahpu’s Day. On the flight back I oversaw an online bottle sale, then built all of our new Week of Logic offerings into Untappd and our point of sale software. This week I’m teaching a TIPS (safe alcohol service) training course, then shooting and editing lots of photos for all of the rad new merchandise we’ve got coming in. What did you do before the beer industry? I spent the last decade working in a few different spots throughout the Disneyland Resort; one of the greatest places to really learn how to problem-solve on the fly. I started as a Tour Guide and VIP Hostess (a “Plaid” as they’re known) while I was going to school at Chapman, then decided to take advantage of the sommelier courses afforded to the Cast Members at Napa Rose by joining that team, and eventually joined the opening team of Carthay Circle Restaurant in California Adventure. Somewhere in there, I helped open Chapter One in Downtown Santa Ana, too. We hear Bottle Logic is planning a distillery and restaurant, how exciting is that? I love the world-building that takes place in restaurants and the intricacies of fine dining, where everything has a place and order and reason. Like, ‘we care about your complete experience so much that the scent of the soap in the restroom was chosen to complement and directly enhance your meal after you’ve washed your hands’ level stuff. I love when the creators obsess over these kinds of details. They’re building a multi-dimensional story. They’re letting you into their heart. I think that translates pretty directly to what we try to accomplish in our tasting room, and what we’ll strive for in the coming restaurant and distillery expansions. What’s your favorite Bottle Logic beer? Barrel-Aged Darkstar November. It really showcases what our barrel-aged program is capable of. I understand you’re a big video gamer…what are you into currently? Do you have a go-to beer while gaming? You seem very ‘hospitality driven’, something that seems to be lacking from a lot of local brewery tasting rooms. What are some things you strive for in a guest experience? People want to be recognized and respected, whether they’re return guests on their way to becoming ‘regulars,’ or if something unusual has happened and the guest needs to express a concern. We have a great track record of improving processes based on guest feedback, and we continue to be made better by our passionate fans. Guest experience in the Tasting Room is absolutely driven by our beertender team. I devote a lot of time to ensuring we make the best hiring choices possible; you absolutely have to have the right people with a genuine heart for service. When you find those people, you need to love them hard. How you treat your team is how your team treats your guests. Certainly, the guest experience at Bottle Logic goes beyond our tasting room, though. We’re at a really fun point where we’re beginning to develop some annual experiences and year-long kind of themed “lore” with tie-in achievements. We see over and over that people want to interact with our brand and I’m so psyched to really start digging into this as we approach year five. How can readers get in on hot new beer releases that are super quick to sell out? The best place to start is our website’s events and releases calendar. As a release approaches, definitely follow our social media. Speaking of Untappd, Anaheim ranked fourth in a nation-wide beer check in contest, and co-founder of Untappd Greg Avola will be joining us for a celebration on April 15th. Please join us!